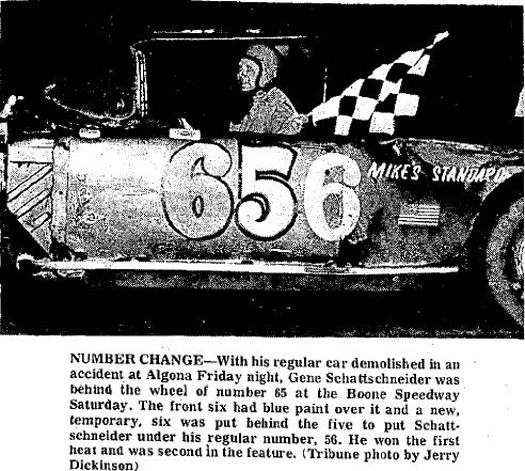 Boone, Iowa (August 21, 1971) - Despite one of the cars looking radically different, it was another Hovinga - Schattschneider duel down to the checkered flag in the super late model feature at the Boone Speedway Saturday night. Denny Hovinga, Laurens, won the event by about two feet, charging by Gene Schattschneider, Algona, in the final straight. The cars came out of number four turn side by side, but Hovinga’s bigger engine pulled him to the narrow victory. Instead of his usual Camaro with a 454-cubic inch power plant, Schattschneider was chauffeuring a blue Chevy, with 350 cubic inches under the hood. The engine is the same one borrowed by Arnie Braland, Boone, a week ago when his 427 was being repaired. The car, which has run under the #65 this season, got a temporary number change to provide Schattschneider with a car after he demolished the Camaro at Algona on Friday night. Schattschneider had led the feature a good part of the way, taking the lead from Darreld Bunkofske, Algona, who had the first lead. Hovinga stayed right behind him, trying to get around, and he finally made it in the last charge to the checkered flag. In the opening time trials the same two drivers had also ran one-two, with Hovinga clocked at 19.43 seconds and Schattschneider turning the oval at 19.46 seconds. In the first race of the night, the trophy dash, Schattschneider was fourth and Hovinga fifth, as Hovinga failed in his charge out of the last turn to get by the Algona driver. They also had exactly the same order of finish and placing - Schattschneider fourth and Hovinga fifth - in the A-Main. Running in different heat races, both drivers also won those events. Wes Smith, Story City, took the trophy dash, his first win in that event all season. The Story City driver also ran third in his heat race and the A-Main, and was fourth in the feature. With a 396-cubic inch engine replacing the 327 he has been running for several weeks, Del McDowall, Ames, finished second in the trophy dash, first heat, and A-Main, and was fifth in the feature. In the trophy dash, Smith went around McDowall on the low side with two laps to go to take the win. The cars were three abreast in the first super late model heat as McDowall, Bunkofske and Schattschneider battled for the lead midway through the race. Hovinga had to work for several laps to get the second heat lead away from Dwight Engleen, Ogden, who was driving number 03 this week, but finally made it around and ran away from the pack. For a while, it was a four-car battle for second between McDowall, Bunkofske, Greg Davis, Boone, and Gail Hoist, Fort Dodge. Davis and Hoist later pulled out of the action. Glenn Woodard, Des Moines, has about salted away the point championship for the season as he took the sportsman feature again Saturday night. He also ran second in his heat race and the trophy dash.